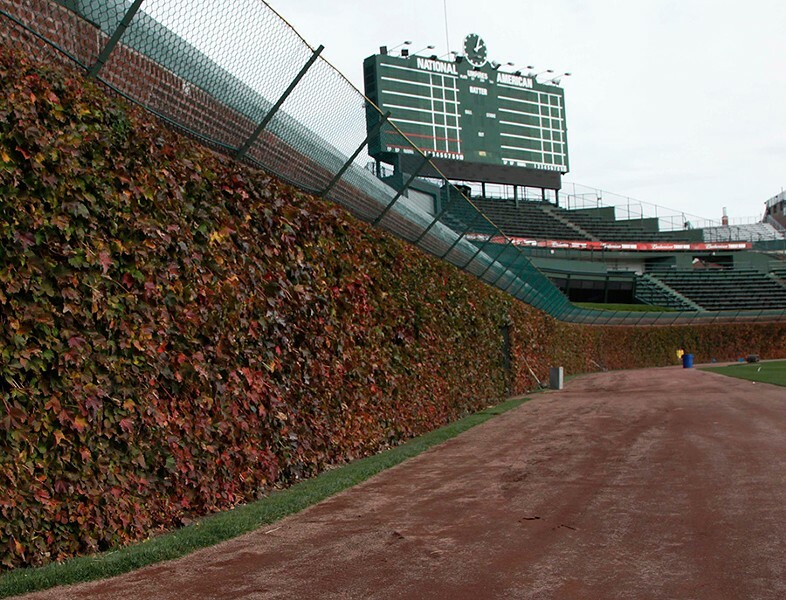 The iconic ivy beckons at Wrigley Field. If Saturday night's baseball game had been an ordinary game, we might have said it was settled in the first inning, when a double, a single, and a dropped fly ball put the Cubs up 2-0 against the Dodgers, and the pitcher who'd shut them out the last time, Clayton Kershaw. Already the Cubs had one more run than they'd need. But this wasn't a game, it was a quest, and it began in 1945; that's the last time the Cubs won a pennant, and not many people around then are alive now. Or it began in 1908, the last time the Cubs won a World Series. That team's fans have all left the earth, along with most people who even remember them. Failure so enduring isn't easily dispelled by good fortune. The Cubs scored again and then again, and I felt a threshold was crossed with the fourth run. It's the one that diminished the haunting precedent of the sixth game of the 2003 NL Championship Series, when the Cubs were sailing along with a 3-0 lead and had their ace on the mound, but disaster struck and the Cubs lost 8-3. (And the next night they lost the seventh game.) As the last few LA batters took their cuts, and the TV cameras scanned the stands, the score by now 5-0, some Cubs fans sobbed but others looked braced and fearful. But suddenly the game was over, ended not by disaster but by a double play. My wife, Betsy Nore, belongs to a bowling league made up of women of a certain age. The teams bowl every Friday at Timber Lanes, about a mile northwest of the ball park, and this past Friday about half the women showed up wearing Cubs T-shirts or jerseys. They were more than simply fans themselves. They talked about doing this to honor their fathers, who'd rooted for the Cubs all their lives and died still waiting for them to win something. One woman reminisced about her grandfather. I was telling a friend of mine about these women. He understood. His son-in-law's grandfather was a Cubs fan, he said, and when the old man died he was determined to scatter his ashes in Wrigley Field. Correctly assuming the Cubs wouldn't give him permission, he collected his grandfather's ashes in his pockets, bought a ticket to a game, and slowly circulated along the rail, letting the ashes drift through his fingers onto the grass. But sometimes the Cubs say yes. Cindy Bandle was the press director for the Goodman Theatre, and before she died in 2005, she had only one last wish. Her husband, Alton Miller, carried it out. "The guy I talked to. . . said he could do it for us, but the rules were, we were not to publicize it or bring too many people," says Miller, "and we were to keep it to to the gravelly warning track, not the grass." The Cubs got a lot of these requests and 90 percent of the time they said no; but Bandle and Miller, who'd once been Mayor Harold Washington's press secretary, had many friends. "So one morning a few weeks after she died," Miller goes on, "a number of Goodman colleagues, plus other family friends—Richard Christiansen and Bernie and Jane Sahlins—met at a little cafe on the south side of Addison at Clark, and trooped over with a box of remains, plus a shopping bag of small jewel/gift boxes which we used to apportion the remains. Different folks then went their different ways, including some independent souls who ignored the warning track restriction and sprinkled her where she would have wanted to be sprinkled. The spreading of the ashes probably took 30 contemplative minutes or so as we fanned out across the friendly confines in ones and two, then all returned to the infield." Friendly confines has always felt to me like an oxymoron. But eternity is boundless, and spending it as dust on your home team's baseball diamond may be as poetic a compensation as death has to offer. Wrigley Field opened in 1914, which means that never—not once in its century—has it been home to a World Series champion. If today's fans pray to live long enough to see one—as their fathers and grandfathers prayed in vain before them—imagine how the ball park itself and all its ghosts must yearn. Those confines are more biblical than friendly. Other fans in other cities also say Wait 'til next year. But as words of comfort and resolve, in Chicago they became the equivalent of Next year in Jerusalem. 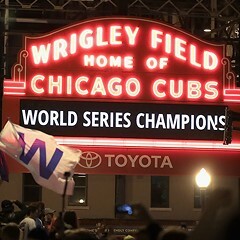 Thousands of fans without tickets gathered outside Wrigley Saturday night to see if next year would be this year. Yes, yes it actually might. But beware. Once faith is rewarded, if it ever is, what becomes of faith?